Global equity markets accelerated, with the S&P 500 finishing with its best weekly gain since December 2011. Yields on the 10-year Treasury note decreased, as geopolitical pressures remained elevated. Oil prices continued to weaken, as they traded below $50 for the first time in over a year. The S&P 500 Index turned its best weekly gain since December 2011, up 4.9%. The primary catalyst arose following a speech by Federal Reserve Chairman Jerome Powell in which he stated that the federal funds rate is “just below” a neutral level that would neither stimulate the economy nor rein in growth to curb inflation. The final push allowed equity markets to finish in positive territory for the month of November. 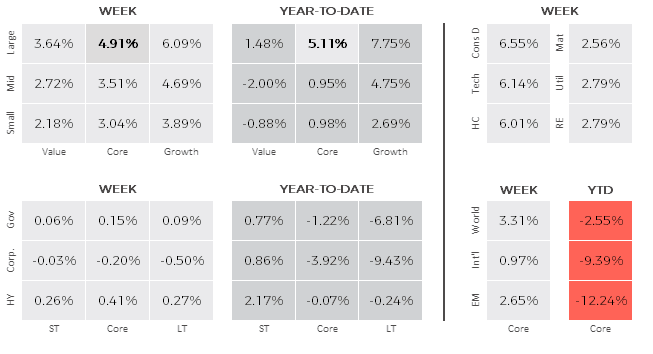 All told, each of the eleven underlying sectors turned in positive results. Large cap stocks outperformed small cap stocks while growth outperformed their value brethren. Consumer discretionary, technology and health care stocks led the way, while materials, utilities and real estate stocks lagged. Non-U.S. stocks, as measured by the MSCI EAFE Index, increased nearly 1.0% as BREXIT fears and Italy’s budget standoff with the European Union (EU) continued to unsettle markets. Developing markets, as measured by the MSCI Emerging Markets Index, turned in strong results, up 2.7%, led by strength across Asia. Chinese and Indian stocks rose significantly, as trade concerns abated and energy prices plummeted. The yield on the benchmark 10-year Treasury fell sharply from 3.08% at the end of trading the previous week to 3.01% at the close Friday. The investment grade corporate bond market struggled to digest a bevy of new supply. Elsewhere, high yield markets rallied amid a risk-on trade though concerns stemming from energy price continued to weigh heavily. It will be a busy week for economic data, with PMI manufacturing data and auto sales set to be reported on Monday, the ISM non-manufacturing index reporting on Wednesday, and November’s jobs report coming Friday morning. Contact us to speak with one of our advisors.